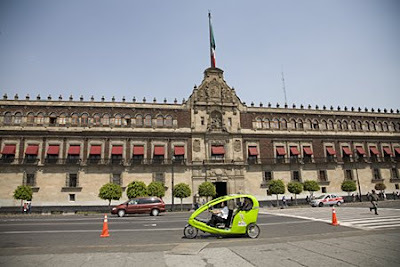 This is what Mexico City’s version of a rickshaw looks like, updated and sleek. The modernized set of wheels is part of the city’s ambitious goal to clean up and go green. Not only is Mexico City one of the world’s largest cities it is also one of the most polluted. These were spotted in the Historic Center. 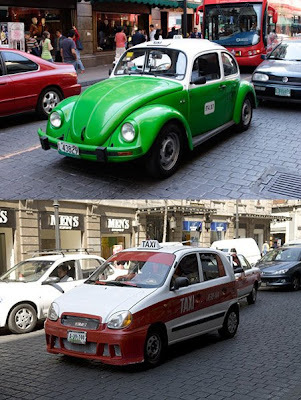 Plans also include replacing the iconic green Volkswagen Beatle taxis with more eco-friendly vehicles by 2012. I still think the best ride in town is the metro. I kind of think those green pedicabs are cute! I was actually surprised to see a very clean metro station that you have photographed in 2007. Cute rickshaws indeed! Did you ride one? How fast do they go and what do they run on? Wow, those things are bright. Though lime green is fitting for Mexico City. the metro stations are clean and some have archaeological exhibits. Hi, I only spent one full day in Mexico City this trio so I did not ride one. Marina, I love Mexico City. Jack, The lime green works well with the beautiful light in Mexico. And we need plantation too. 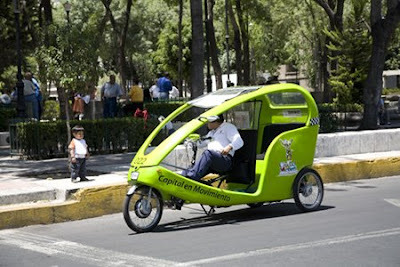 Im waiting for the metro to launch in our cities but yes, it would be good to have these green pedicabs in our cities too.. I think those green pedicabs are cute too! But I'm with you, the metro is a more eco option. Very well done. Green and stylish. Hopefully that will catch on there and elsewhere. Hobo, I believe planting is part of the plan as well. Flygirl, and much more convenient as it covers more ground. Gennaro, I believe they have these in Dublin as well. i want that green bug!